Galvanization refers to any of several electrochemical processes named after the Italian scientist Luigi Galvani. In general use the most common meaning refers to the process of coating a metal, usually steel with zinc as a protection against rusting. Unlike paints, which can also protect steel from corrosion, zinc coatings protect exposed edges and scratches due to the fact that zinc reacts with oxygen more readily than the iron in steel. In corrosive environments, therefore, zinc, in essence, takes the corrosive force upon itself while protecting the steel. Zinc coatings save industry and consumers 10s of billions of dollars each year in applications ranging from bridges to cars. Originally, galvanization was the administration of electric shocks (in the nineteenth century also termed Faradism, after Michael Faraday). It stemmed from Galvani's induction of twitches in severed frogs' legs, by his accidental generation of electricity. This archaic sense is the origin of the meaning of galvanic when meaning “affected/affecting, as if by a shock of electricity; startled”. Its claims to health benefits have largely been disproved, except for some limited uses in psychiatry. Later the word was used for processes of electrodeposition. This remains a useful and broadly applied technology, but the term "galvanization" has largely come to be associated with zinc coatings, to the exclusion of other metals. In current use, it typically means hot-dip galvanizing, a chemical process that is used to coat steel or iron with zinc. This is done to reduce corrosion (specifically rusting) of the ferrous item; while it is accomplished by non-electrochemical means, it serves an electrochemical purpose. Zinc coatings prevent corrosion of the protected metal by forming a barrier, and by acting as a sacrificial anode if this barrier is damaged. When exposed to the atmosphere, zinc reacts with oxygen to form zinc oxide, which further reacts with water molecules in the air to form zinc hydroxide. Finally, zinc hydroxide reacts with carbon dioxide in the atmosphere to yield a thin, impermeable, tenacious and quite insoluble dull gray layer of zinc carbonate that adheres extremely well to the underlying zinc, so protecting it from further corrosion, in a way similar to the protection afforded to aluminum and stainless steels by their oxide layers. Hot dip galvanizing deposits a thick, robust layer that may be more than is necessary for the protection of the underlying metal in some applications. This is the case in automobile bodies, where additional rust proofing paint will be applied. 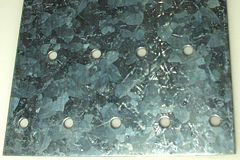 Here, a thinner form of galvanizing is applied by electroplating, called "electro-galvanization." However, the protection this process provides is insufficient for products that will be constantly exposed to corrosive materials such as salt water. Nevertheless, most nails made today are electro-galvanized. Galvanic protection (also known as sacrificial-anode or cathodic protection) can be achieved by connecting zinc both electronically (often by direct bonding to the protected metal) and ionically (by submerging both into the same body of electrolyte, such as a drop of rain). In such a configuration the zinc is absorbed into the electrolyte in preference to the metal that it protects, and maintains that metal's structure by inducing an electric current. In the usual example, ingots of zinc are used to protect a boat's hull and propellers, with the ocean as the common electrolyte. As noted previously, both mechanisms are often at work in practical applications. For example, the traditional measure of a coating's effectiveness is resistance to a salt spray. Thin coatings cannot remain intact indefinitely when subject to surface abrasion, and the galvanic protection offered by zinc can be sharply contrasted to more noble metals. As an example, a scratched or incomplete coating of chromium actually exacerbates corrosion of the underlying steel, since it is less electrochemically active than the substrate. The size of crystallites in galvanized coatings is an aesthetic feature, known as spangle. By varying the number of particles added for heterogeneous nucleation and the rate of cooling in a hot-dip process, the spangle can be adjusted from an apparently uniform surface (crystallites too small to see with the naked eye) to grains several centimeters wide. Visible crystallites are rare in other engineering materials. Protective coatings for steel constitute the largest use of zinc, which had few uses prior to the development of galvanization. Metallic zinc is not particularly useful by itself, but it becomes a valued metal due to its galvanic property, whereby it increases many-fold the utility of steel. ↑ Galvanic at Dictionary.com. Retrieved November 30, 2006. This page was last modified on 29 August 2008, at 14:02.